T3's mission is to seek out and showcase beautiful things that help you live a smarter, better life. To do this, we filter the latest tech, home and lifestyle products and experiences to ensure you only ever buy the best of the best. Things you'll cherish and enjoy using. T3.com is one of the the UK's leading consumer lifestyle websites and T3 magazine is its print counterpart. You can follow us on Twitter, Facebook and Instagram. We present products in helpful buying guides and carefully curated deals posts across style, living, auto, smart home, watches, travel, fitness and more. We truly do have the best of everything. 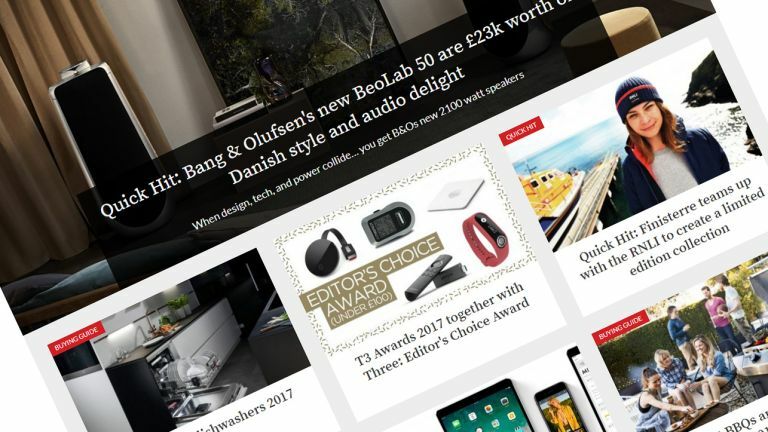 We're delighted that over 6 million people visit T3.com every month and 38,000 people buy a copy of T3 magazine every month. Matt’s been working in tech publishing for nearly 10 years, and has tested everything from smarter phones to racing drones, at admittedly varying levels of longevity. His email is always open to new tech and questions about the mag. Responsible for bringing each issue of T3 to life, Michelle has worked on a range of beautiful magazines, including Professional Photography, BBC Focus and the National Trust magazine. We take pride that our reviews are independent and free from commercial considerations. We never take money for reviews. Nothing that has a star rating has been paid for. Separate to our editorial content and process, we do run advertorial feature content which is clearly marked and tagged as ‘sponsored’. We sometimes take trips and hospitality to attend shows and see products. We always mention this within our coverage. It doesn’t affect how we think about products, but does affect whether we cover certain products (as in we may not have been able to get to see a certain product had the company not taken us to see it). Almost all our review products are sent to us by the companies involved and almost always as a result of our request. We only review the products we think are worth reviewing. We always return products on request or at the end of our agreed loan period. We score products on a scale from 1 to 5 stars. Three stars is a good to very good product, four stars is an excellent product. Five stars is never awarded lightly and is a mark of exceptional quality. We often include shopping links in articles to enable readers to buy the products we write about – these prices are automatically populated from a selection of retailer pricing. Our parent company, Future Publishing, gets paid a small percentage of the purchase price if someone clicks through and buys a product as a result of using these links. That price, known as an affiliate fee, is not added to your purchase price so the price you pay is the same whether you click to visit the retailer from T3.com or you go to the retailer's site direct. Please pitch by email primarily and include images or links to images wherever possible. Please don’t pitch by Twitter or other social media platforms. Phone calls are fine, but if it’s to ask whether or not you should send a press release then please just send it if it is relevant. We rarely cover products sent in on spec so please check with us before sending review samples. We don’t cover startups, business or industry stories, fintech or financial results or individual apps (unless part of a larger app roundup, which we occasionally do). We also don’t publish stories based on surveys or similar – we publish depending on the strength of a product. We rarely cover crowdfunded projects and if we do, the projects we cover will generally have already reached their funding goal. T3 is a member of the Independent Press Standards Organisation (which regulates the UK’s magazine and newspaper industry). We abide by the Editors’ Code of Practice and are committed to upholding the highest standards of journalism. If you think that we have not met those standards and want to make a complaint please contact us by calling 01225 442244 or writing to us at Future Publishing, Quay House, The Ambury, Bath, BA1 1UA, UK. If we are unable to resolve your complaint, or if you would like more information about IPSO or the Editors’ Code, contact IPSO on 0300 123 2220 or visit www.ipso.co.uk.